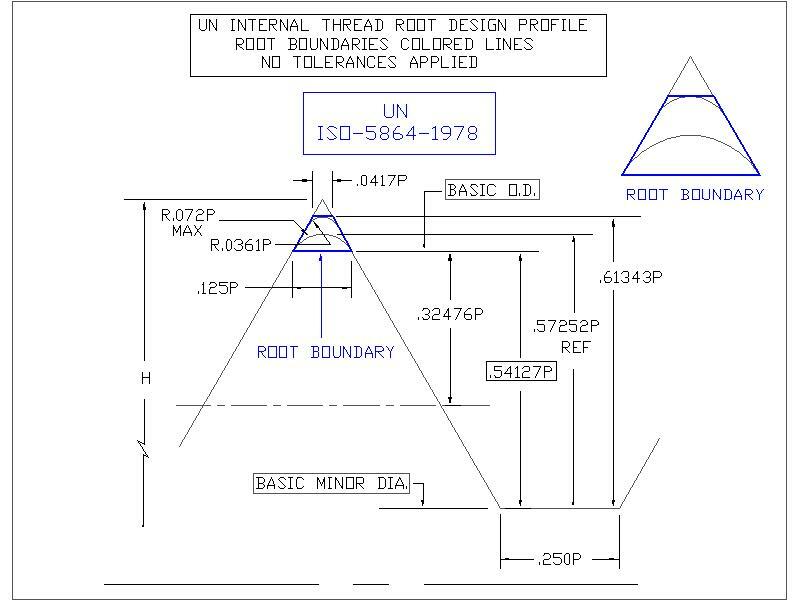 The other reason is to get a look at the root dimeter profile because when cutting a thread the root diameter is important in that it determines the strength of the thread. When cutting a thread, plunging the cutter deeper to get to size reduces the root diameter. 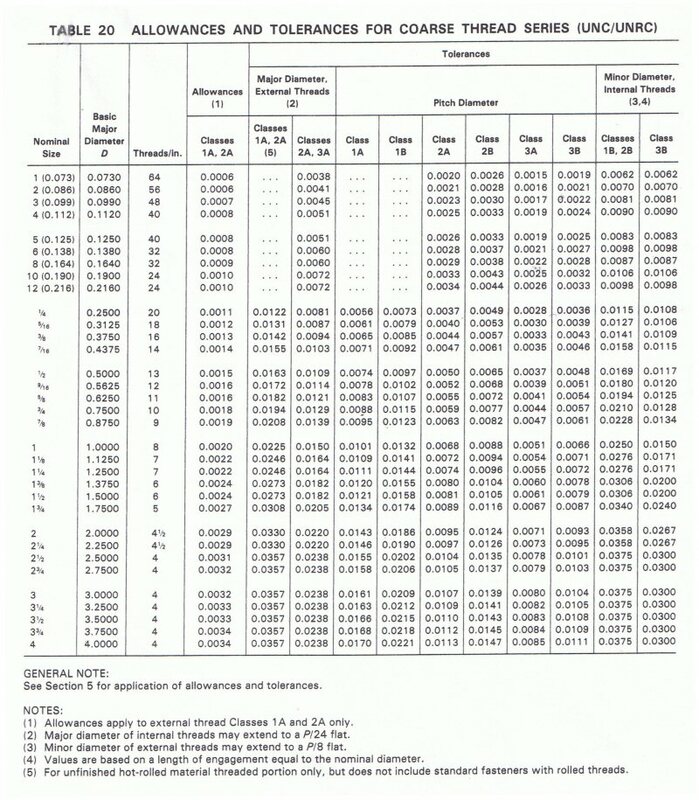 All the data required, with the exception of tolerances and allowances, is in "The Easy Memory Chart". The flank of the thread must be perpendicular as indicated by the symbol in the drawings. The minor diameter of an external thread is controlled by the depth of cut and the pitch diameter tolerance. 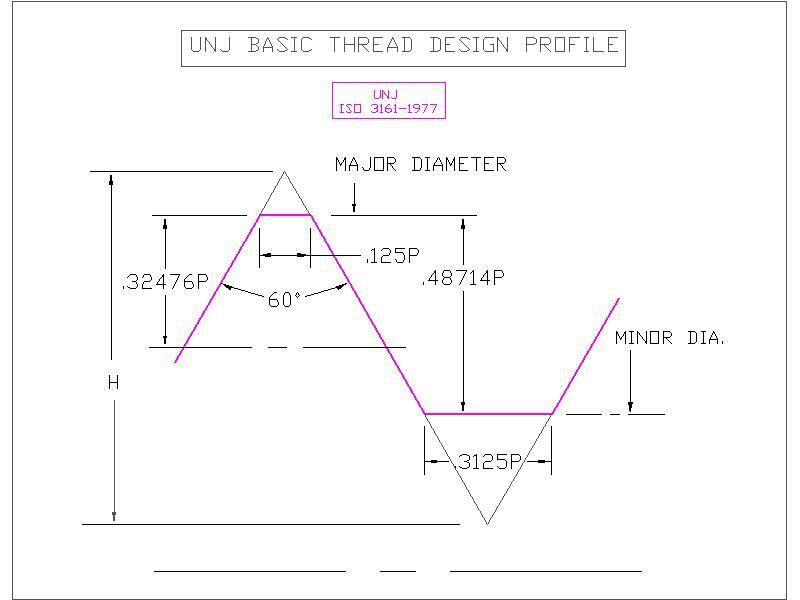 The only difference between a UN internal and a UNJ internal thread is that the minor diameter of a UNJ internal is increased by .054127P X 2. (.054127 is 10% of .54127). The section "A Practical Method to cut a Thread" is included so that even a novice could cut an accurate thread. The section "General Notes" contains some miscellaneous observations. 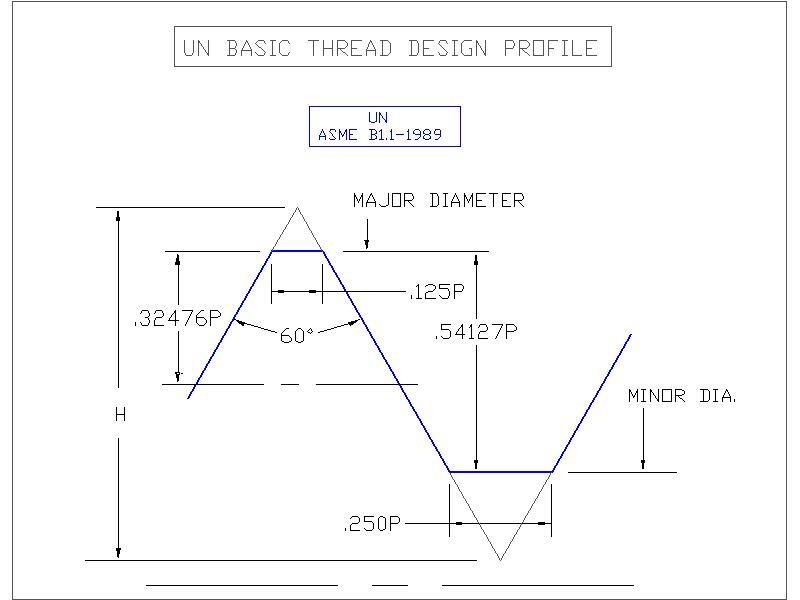 Using the "Easy Memory Chart" (see the drawings to clarify), I can accurately cut a UN class 3 external thread and know that is correct and will fit without having to use a gage or any tables. I would just stay away from MMC on all 3 diameters. For a class 1 or 2 external, however, I also need to know the allowance, which is available in Machinery's Handbook. 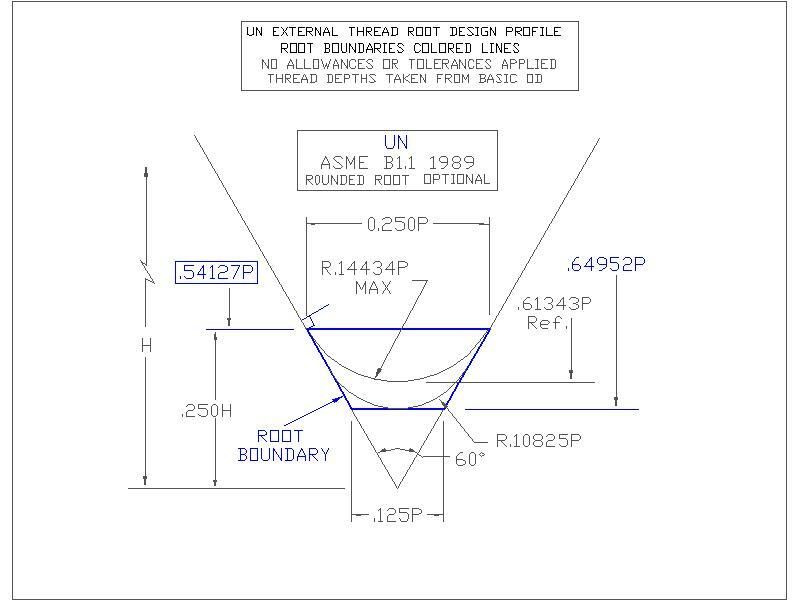 (within limits) the thread profile will be correct. then for a UNJ increase the minor diameter by (.054127P X 2). UN BASIC MINOR DIA. = basic O.D. - (2 X .54127P). BASIC P.D. = Basic O.D. - .64952P (UN,UNR,UNJ,External & Internal). Max. D.O.T. is D.O.T. selected plus 1/2 the allowance plus 1/2 the P.D. tolerance. MOW = Nominal O.D. - (1.5155P) + 3W (W = actual wire size used). MOW = Pitch Diameter - (.86603P) + 3W (W = actual wire size used). 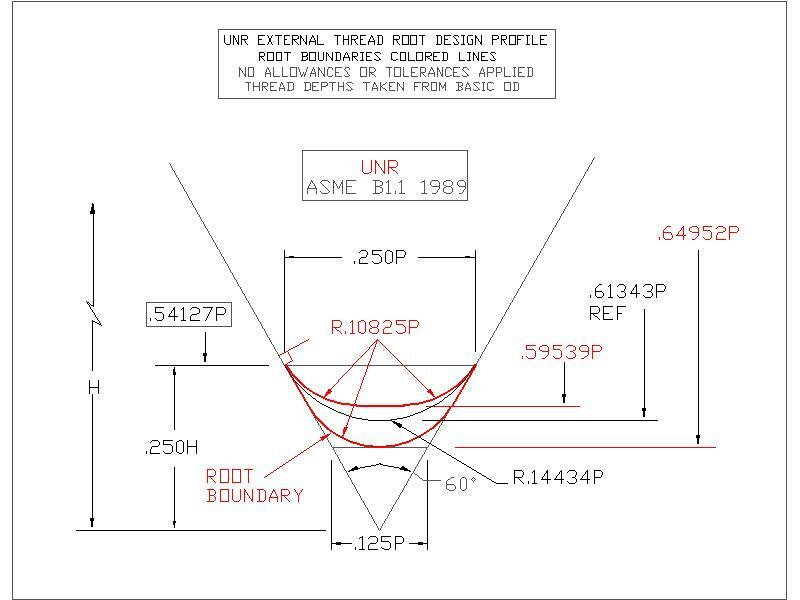 1) Using the "Easy Memory Chart" calculate the following--Pitch Diameter, Depth of Thread, Best Wire Size, Measurement Over Wires and the UN basic minor diameter (if you are cutting an internal thread). Be sure to use the actual wire size used, not the best wire size, in the Measurement Over Wires formula..
2) Machine the reference diameter, O.D. for external, I.D. for internal. Do not chamfer the leading edge, this will allow the cutter to take the initial shock on the flank as opposed to the tool tip. 3) (Important) Make sure that the threading tool has no rake, the profile is correct, it is on center and perpendicular to the work. (Use a sharp pointed cutter with a small radius honed on the point). 4) Set the lathe levers or change gears for the desired pitch or T.P.I. Then take a light cut to check it is correct and set the crosslide dial to zero. 5) To cut an internal thread first cut an external thread, to MMC, to use as a gage. Then machine the internal minor diameter (basic) as a reference for the depth of cut. 6) Set the compound parallel to the lathe axis, then feed the cutter in using the crosslide and the compound, whatever you feed in on the crosslide, feed � of that on the compound�for example, if you feed .012 radially (.024 dia.) on the crosslide, feed .006 on the compound. This means that most of the chip will be coming off the leading edge of the cutter preventing the chip from piling up in the middle, it is similar to feeding the cutter in at 29 1/2 degrees . When you reach the proper depth you can now move the compound back and forth to get the pitch diameter without changing the minor diameter. Set the mike to .025" over the O.D. Set the mike on top of the thread. Insert two wires between the mike anvil and the bottom of the thread. Take the other wire and insert it between the mike spindle and the top of the thread. Take the measurement (make sure the 2 bottom wires are both tight) and observe the reading, back off the mike to get the wires out and remove the mike. Reset the mike to the observed reading and lock it----you now have the M.O.W. recorded on your mike. 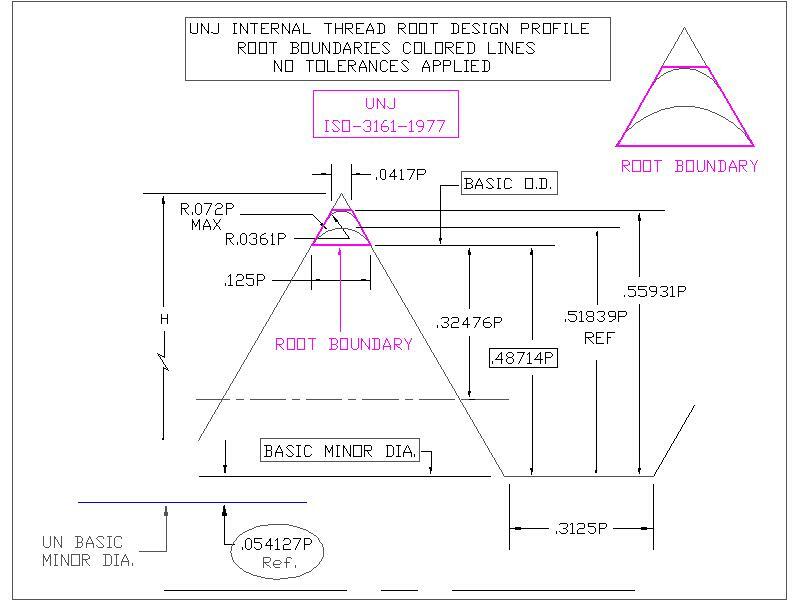 Flanks of all UN, UNR, UNJ external threads to be straight above the basic minor diameter (as shown by the perpendicular sign in the drawings), for internal threads it is below the basic major diameter. (Therefore, if cutting a UN external flat root at MMC the tool must be sharp, absolutely no radius). PD (basic) is the same for UN, UNR, UNJ, external, internal. Allowance is always applied to external. There is no UNR internal. 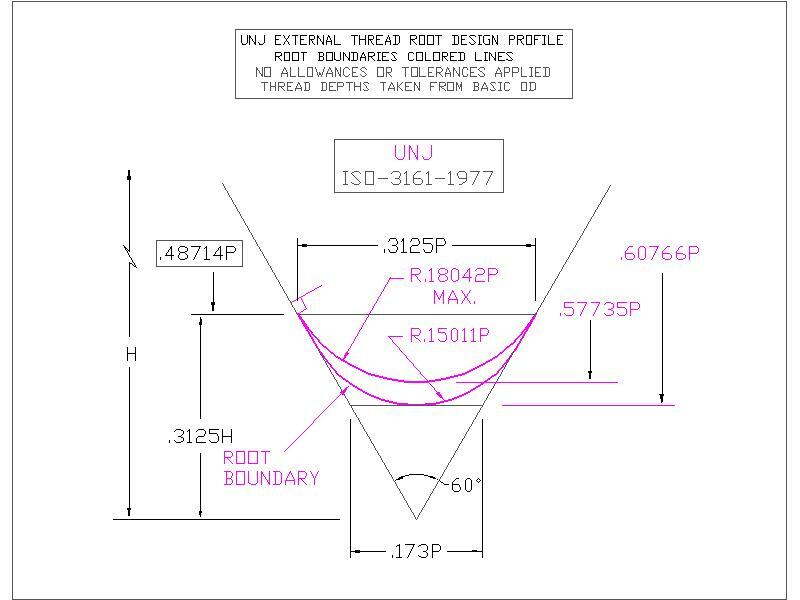 A UNJ bolt will only mesh with a UNJ nut. The min. root radius of a UNJ external is greater than the max. radius of a UN, UNR. Threads are only rolled up to 1� diameter after which they are cut. (Rolled is stronger). A bolt is loaded in tension, a nut is loaded in compression. Do not exceed 83% AN TDS, (100% UN). There is no class 1 for sizes below � ". P.D. tolerance internal is greater than the P.D. tolerance external. (By 30%, ASME B1.1- 1974). UN bolts- tensile strength 60,000 psi. UNJ bolts- tensile strength 160,000 psi. UNJC, UNJF, 8UNJ � 1 diameter. UNJEF, 12UNJ, 16UNJ � 9 pitches. ����������� Max. = .64952P + �� allowance + � PD tolerance. ����������� Min. = .54127P (no radius) + �� allowance. ����������� Best DOT = .61343P + �� allowance + � PD tolerance used. ����������� Optional but not to exceed .14434P (@ .61343P D.O.T.). ����������� Max. =� Nominal � �allowance. ����������� Min. =� Nominal � �allowance� �� tolerance. ����������� Max. = nominal O.D.� �� .64952P � allowance. ����������� Min. = PD Max.�� tolerance. ����������� Max. = nominal O.D. � (.54127P x 2) no radius �� allowance. ����������� Min. = nominal O.D. � (.64952P x 2) � allowance� � PD tolerance. ����������� Max. = .61343P + � the P.D. tolerance. ����������� Best� = .57252P + � PD tolerance (allows for a radius of 0 to .072P). ����������� Max. = .64952P + � allowance + � P.D. tolerance. ����������� Min. = .59539P + � allowance. ����������� Best = .61343P� + � allowance + �� P.D. Tolerance used. ����������� Max. = Nominal � allowance. ����������� Min. 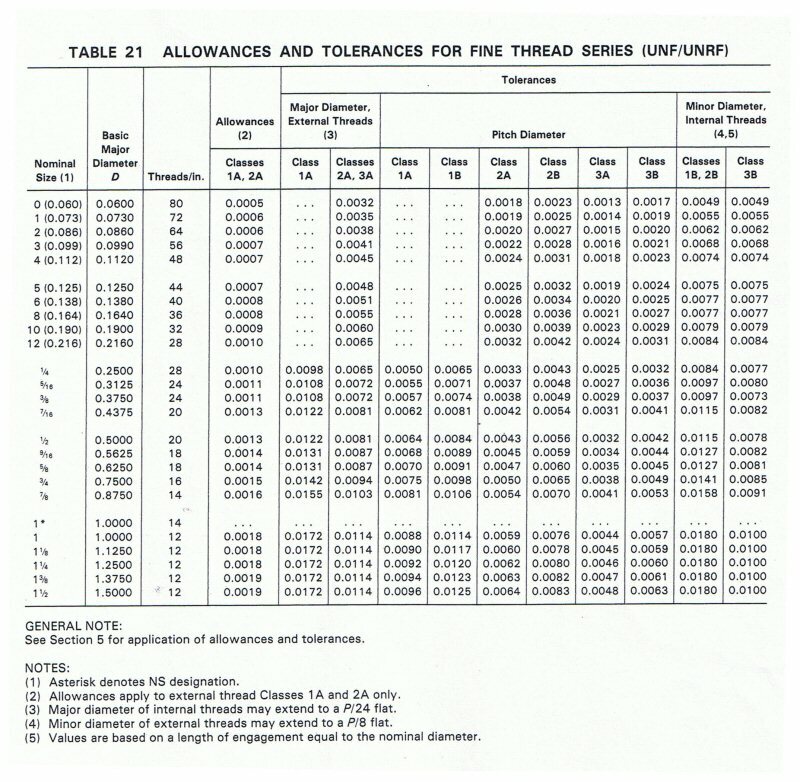 = Nominal � allowance � tolerance. ����������� Max.= nominal O.D. � .64952P � allowance. ����������� Min. = PD Max. � tolerance. ����������� Max. = nominal O.D. � (.59539P x 2) � allowance. ����������� Min. = nominal O.D. � (.64952P x 2) � allowance � P.D. Tolerance. ����������� Max. = .61343P + �� the P.D. tolerance. ����������� Best� = .57252P + �� PD Tolerance (allows for a radius of 0 to .072P). ����������� Max. = .60766P @ R .15011P + �� P.D. tolerance. ����������� Min. =� .57735P @ R .18042P max. Best� = .57735P @ R .15011P to R .18042P + �� P.D. Tolerance used. ����������� Min. .15011P���� ������������������������������������������������������� ����������with UNR .10825 root radius. ����������� Min. = Nominal �� tolerance. ����������� Max. = Nominal O.D. � .64952P (same as UN ). ����������� Max. = Nominal O.D. � (.57735P x 2)� @ R .18042P. ����������� Min.� = Nominal O.D. � (.60766P x 2)� @ R .15011P �� P.D. tolerance. ����������� Max. = tables������������������������������������������������������������������� �����Max.= Basic + PD tol. ����������� Min. = .48714P (Sharp tool no radius). ����������� Max. = .55931P + �� the P.D. tolerance. ����������� Best� = .51839P + � PD tolerance (allows for a radius of 0 to .072P). ����������� Min. =������������������������ =.0244 (Sharp tool no radius).